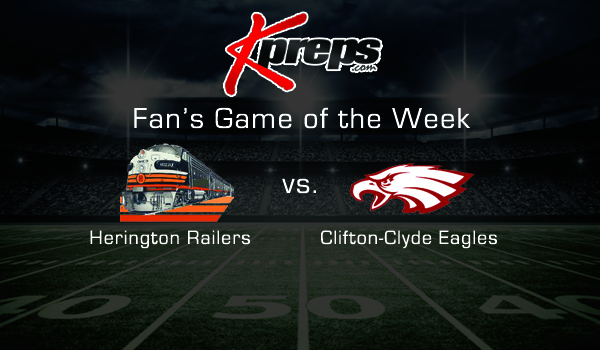 Clifton-Clyde and Herington have never played each other in high school football. The Eagles and Railers will have very different defenses but similar offenses for coaches Russ Steinbrock, and Tom Flax. Flax, who comes from a family of coaches, has incorporated the same single wing attack at Herington used by Steinbrock and powerhouse Spearville to great success. Both teams have opened a surprising 4-0 and will play in a key Eight-Man, Division I, District 3 contest Friday at Clifton-Clyde. “We really feel like we are looking in the mirror,” Steinbrock said. Clifton-Clyde, which narrowly lost to Osborne in the sub-state semifinals in 2013, won just three contests the last two seasons. Last week, the Eagles earned statewide attention for their 74-72 double overtime victory at Rural Vista to open district play. Rural Vista was ranked No. 4 in Division I at the time. The Heat led 58-36 with just over nine minutes to play when Clifton-Clyde ended regulation with 22 straight points. Sophomore Drake Steinbrock scored from three yards out with 36 seconds left, and senior back Caleb Charbonneau won the game with a 10-yard run. “You don’t actually come back from that kind of a deficit very often, and then to go into a double overtime, that’s just a very unusual situation,” coach Steinbrock said. Herington, in its first season of eight-man football, was winless last fall and had just 11 victories from ’05-15. “For my juniors and seniors who have battled a lot, and haven’t had a whole lot of wins to show for how much effort they put in, it’s nice to see them get some recognition for the effort,” Flax said. Defensively, Clifton-Clyde normally sees 3-2 defenses. Now, the Eagles are in a new district with a different area of Kansas. Rural Vista used a 5-1 defense. Herington also uses a 5-1 and a 3-4. Clifton-Clyde has allowed 88 points, Herington 124. Flax has nine siblings from former Thomas More Prep-Marian coach Eugene Flax, who passed away when Tom was six in 1987. Two of Flax’s sisters, Lorie Stein and Janelle Geist, were longtime successful girls’ basketball coaches, most notably at Spearville and Abilene, respectively. Janelle’s husband, Jeff, coached Abilene football for many years. Last fall, Flax went to watch his nephew, standout Spearville quarterback Nathan Stein, who engineered the Lancers to a dominant 13-0 season and mercy rule win versus Hanover in the Division I state title game. Spearville’s high-octane single wing offense has propelled the Lancers to a 27-1 record since the start of 2014. Flax saw Spearville play against Solomon in person, against Central Plains online and then saw the state title game. He believed the single wing would fit Herington, and reached out to Lancer coach Matt Fowler for help. As well, Flax started his head coaching career at Southern Cloud before he came to Herington four years ago. At Southern Cloud, Flax coached against Clifton-Clyde and its dominant, run-heavy single wing offenses that often use seven blockers and a direct snap to the back. Flax has incorporated “similar” Clifton-Clyde principles in combination with Spearville’s ideas. The single wing offense has led to 238 points, the best scoring offense in Division I. The Eagles have scored 202 points, one of 11 Division I squads to average more than 50 points a game. Herington has averaged 363 rushing yards a game and forced 17 turnovers with a plus-13 turnover margin. In addition, Flax said the Railers have had around six onside kick recoveries. “That’s one thing in the eight-man game that’s a lot different than the 11-man game is the special teams, especially with the kickoffs and even with the punts,” Flax said. Senior standout back Tate Becker missed last week’s win at Onaga with a leg injury but is healthy for Friday. He has 183 passing yards, a 3/1 TD/INT ratio and 63 carries for 469 yards and seven scores. Senior Richard Hagerman has 71 carries for 473 yards and 13 touchdowns. Senior Jonathan Lollar has 10 catches for 373 yards and six scores, along with six interceptions on defense. Junior Trenden Schneider adds to the depth with 31 carries for 352 yards and six touchdowns. Up front, Flax labeled senior Mitch Black probably the best center he has ever coached. Black is consistent with the varied snaps in the single wing and blocks with solid technique. Flax labeled senior guard Nate Backhus (6-foot-3, 240 pounds) “like a freight train” on pulling plays. The Eagles had six starters back on both sides for Steinbrock, 90-47 with a state runner-up finish in his 15th year as head coach. Steinbrock said the Heat, under longtime coach Jeff Hostetter, gave Clifton-Clyde problems with a spread look and then running the option. The Eagles, which had some injuries during the game, changed some assignments and slowed down the Heat’s option success. Rural Vista had some success throwing, but the Eagles broke through for several sacks and forced scrambles. Clifton-Clyde outgained the Heat, 477-375. The Eagles’ run defense has allowed 84.3 rushing yards per game and 2.5 yards per carry. Additionally, the Eagles were able to return to their ground game late and continued to move the ball. Charbonneau, the son of 1978 Clyde Shrine Bowler John Charbonneau, rushed 40 times for 226 yards and five scores. He completed 8 of 14 passes for 122 yards and three touchdowns. Charbonneau has 691 rushing yards and 13 rushing touchdowns this season. Flax compared Charbonneau to former Clifton-Clyde standout Brayden Bloomfield, who rushed for 68 scores in 2008-09. Senior center/guard/defensive end Michael Cyr and senior center/linebacker Shawn Fahey have emerged as leaders and both started on the offensive line for three years. Senior lineman Justin Shutt (6-3, 245) has blocked well. Senior tight end/defensive end Eli Ohlde (6-3, 243) started as a freshman on both sides of the ball for the 9-3 team in 2013. In the sub-state loss to Osborne that year, Ohlde suffered a concussion and was unable to play as a sophomore the next season. Ohlde tweaked his knee versus Rural Vista, didn’t play again, and is uncertain for Friday. Senior Cordell Cyr and junior Elias Girard have played well at blocking back. Sophomore Nathan Ohlde starts at end, though might start at defensive end, too, if his brother can’t play. Senior Matt Barnes starts at corner for a squad that has permitted just 4.4 yards per pass attempt. “Probably the biggest problem that we have had over the past two years has been our pass defense, and I think we are a much improved pass defending team as well,” Steinbrock said.